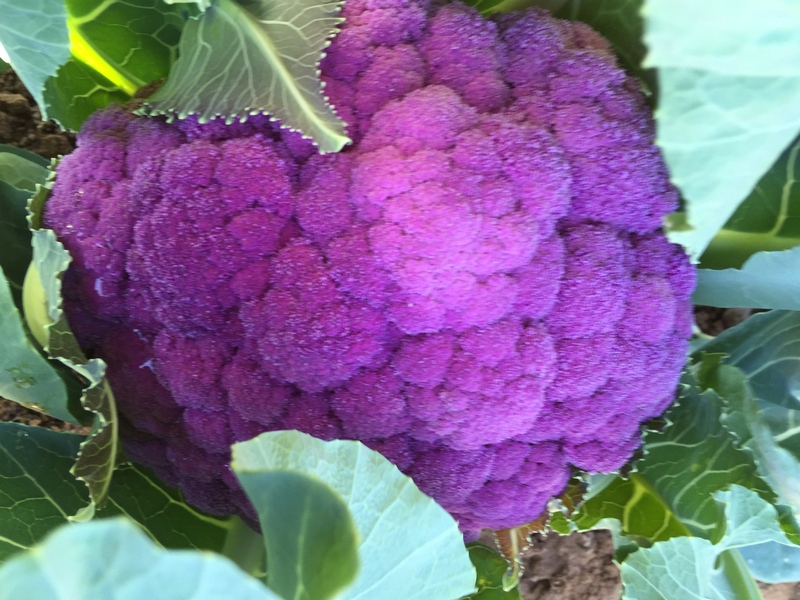 Trim and cut into florets as many heads of McClendon’s colored cauliflower – orange, purple, green, romanesco, white – as you’d like to use. In large bowl, toss with olive oil and salt & pepper and spread on shallow sheet pan and roast in oven at about 400 degrees, checking every 10 minutes or so until nice and golden. Decide how much crumbs you’d like to make…a whole Noble loaf makes a lot of crumbs. Any left overs are delicious in salads, on soups & pastas, or on other roasted veggies. Trim the crust from the portion of bread you will use…I find the crust is too difficult to grind, but is tasty toasted as a snack…and tear or cut the bread into smallish pieces. Grind in a food processor until coarse crumbs. Toss in a bowl with a little olive oil and spread on a sheet pan. Toast in 425 degree oven, checking and stirring often until deep golden brown. Depending on amount of crumbs: drain & pat dry some capers. Heat some olive oil in a shallow skillet and fry the capers until crispy, drain on paper towels. Finely chop some green or regular garlic and zest some Meyer or regular lemon and chop some flat leaf parsley. Gently crumble the fried capers and combine with garlic, zest and parsley. Toss with the toasted crumbs, adding a little more olive oil if too dry. Serve the roasted cauliflower warm or room temperature, garnished with lots of crumbs and a little more good olive oil if you like. Some grated parmesan or other hard cheese is a nice addition, as is some chopped toasted nuts or pepitas.